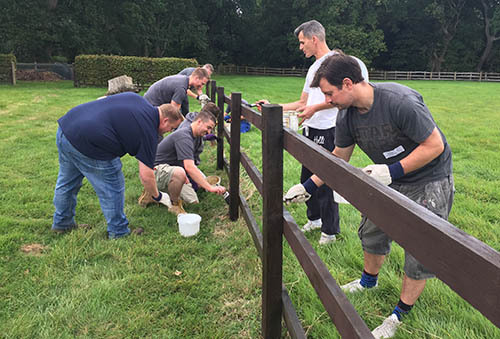 We had a rewarding team day at Chestnut Tree House Hospice in Arundel, Sussex last week. 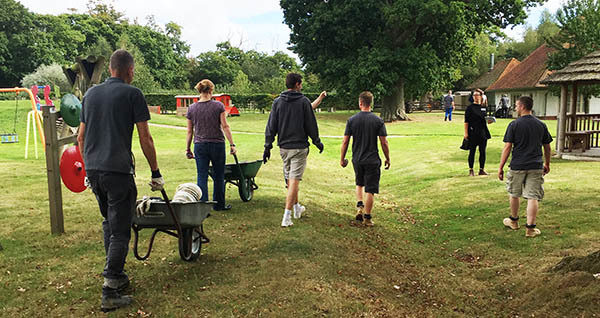 The day gave us the opportunity to help save Chestnut Tree House a great deal of money in ground maintenance fees. It also provided an excuse for all our staff to be together and get involved in something for a good cause. Smoke Control Solutions and S J Fry Window Controls have created a partnership with Chestnut Tree House to help the charity with their fundraising. The staff there looked after us well, making sure we had access to lots of tea and coffee and provided us with lunch and cakes – so a big thank you to Chestnut Tree for your hospitality! It definitely got us working harder! We got to work clearing a fence of weeds, old garden debris and wire fencing, to then be able to creosote all the way along. Thanks to all our staff for working so hard and for proving that we are a great team! Check out our Facebook page for more images of the day. Before lunch we were given a tour of the hospice by members of staff, who explained what the charity provide for local families in Sussex. We now have a better understanding of how the charity works and how much help they provide to families that need it. It also gave us an insight into what a difference any form of donation can make to families in their care.